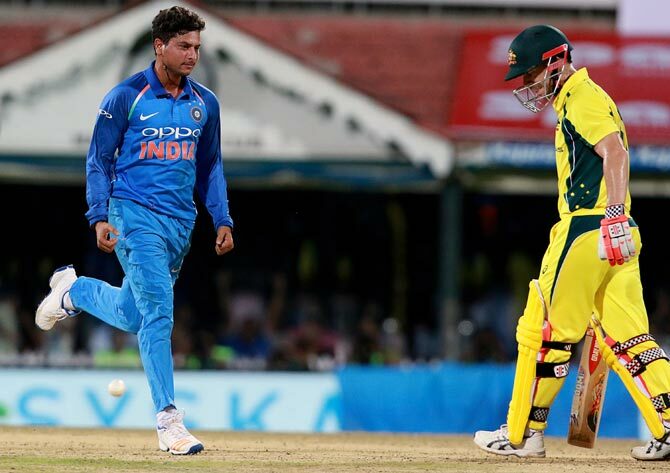 Young wrist spinner Kuldeep Yadav believes he can dismiss David Warner 'anytime' as the Australian vice-captain seems 'under pressure' while facing him. 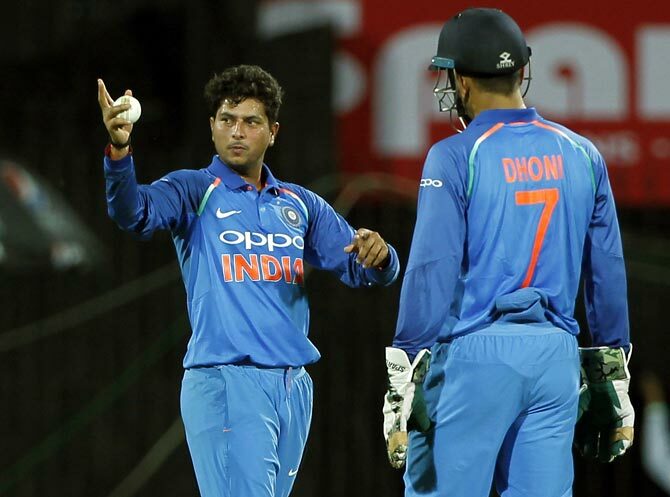 "I guess he (Warner) takes a lot of pressure while batting against me and that makes me feel that I can get him out anytime," Kuldeep said on the eve of second ODI against Australia, in Kolkata, on Thursday. The Uttar Pradesh spinner claimed that he has never feels any pressure while bowling to Warner. "It's good that there is no pressure on me and I enjoy bowling to him. I always feel to get him out and set my plans accordingly. I will try to get him out more," he said. "Kisi player pe agar aap haavi ho to jaldi out karne ki koshish karoge (whenever you have an upperhand over a particular player, you would try to get him out as quickly as possible)," the youngster said. However, Kuldeep rates rival captain Steve Smith as the toughest Aussie batsman he has bowled to. "Conventional spinners have only one or two variations but wrist spinners have the quality to decieve the batsmen. It becomes good experience to have two wrist spinners in the team, both are of attacking types and chances of taking wickets are more," he replied when asked about his experience of bowling with the Haryana leg-spinner. "It's a rare instance. In junior cricket too, I never bowled with another wrist spinner operating from the other end. It was always the conventional left-arm spinner. In Ranji Trophy, I was in the UP Ranji team that also had senior leg-spinner Piyush Chawla. Since he was the senior bowler, I rarely got my chances (in Ranji Trophy)," he lamented. Yadav came into limelight in 2014 during the Indian Premier League game between Kolkata Knight Riders and Mumbai Indians. Kuldeep does attribute the help that he got from the former India leg-spinner Chawla. "When you graduate from Under-19 days, you need support to guide you how to handle situation. Likewise Piyush bhai has supported me." Yadav said he along with Chahal are shouldering responsibility in absence of the regular Indian spin duo of Ravichandran Ashwin and Ravindra Jadeja which will be a great learning experience for the future. He also pointed ou that Hardik Pandya's all-round abilities gives necessary balance to the side. "Definitely, it's always necessary to have a bowling all-rounder in team, who can finish bowling or batting quota. Pandya can change the game anytime. He plays freely and changes the momentum. It's a big thing to have him in team," he concluded. Will Rahul replace Rahane for 2nd ODI? Should Australia retain Zampa for 2nd ODI?